I find myself running to the window if I happen to hear a car drive by. The curiosity not so much about the fact that there even is a car going by on our dead end road but rather: will that car actually turn around and come back past us or will it disappear into the Berlin Pond Triangle...made entirely of mud? The fifth season of our year has descended upon us. We still have six foot snowbanks but the stream has broken free and there is also a constant rivulet racing down the road. Spring may be in the air..not so much on the ground. In our house we have stowed away all irrelevant footwear. Left standing is the trusty Muck boot. I was running errands in downtown Montpelier yesterday and made note of the fact that every single person I saw was wearing mud boots. Mud boots with work skirts, suits and ties, mud boots on babies who can’t even walk and one man passed me wearing shorts (dreamer), a wool jacket (realist) and….mud boots. It is one of the reasons I love living here. I have friends who suffer from lack of sunlight during the long winters of the Northeast. We have had snow on the ground this year since mid November. Temperatures rarely reached freezing and were more likely found in the negative digits this winter. I understand why friends feel the four walls of their homes beginning to lean in on them. I write this in hushed tones, but I love winter, I love bundling up and walking the dogs, fires in the wood stove, wool blankets- all of it. But I admit, I have had to work through some of my challenges with mud. When I am wiping dogs paws for the tenth time by eleven in the morning, it feels like I've reached breaking point. But it's like being out in the pouring rain- at some point you can't get any wetter and you begin to accept. I haul on the Muck boots, walk the wooden planks that Paul has carefully placed along the walkway to the front door, climb into the, unrecognizable as such, car, which smells like mud inside. I put Shostakovitch into the CD player (yes, CD player) and meander down the road. When the wheel first begins to yank to and fro as I hit the ruts I rail at the road, at the mud, at the neighbor’s dog who is just standing on the side of the road, but then something happens, I begin to realize that if I simply slow down (challenge for me), breathe and keep going I will get to my destination, I will get there. The ruts remain rutted but I will hit pavement eventually. The mud remains mucky but history tells me that it will dry up and the snowdrops will peek their little white heads out of the ground to see if it is safe to make a full appearance. My dogs will continue to race into the house before we have the chance to grab their foot towel but, if I breathe, I remember that this, too, shall pass and they will be racing into the house soaking wet from swimming. And so I continue on this journey, much like the journey with the cello, following my rutted path. It is, after all, mud season, the perfect time to be messy. The calendar flipped to the month of Spring a few days ago. Today I was out walking the dogs down the still frozen dirt road, still frozen and icy dirt road. As I trudged uphill I could hear the chickadees chattering in the bare trees- flitting back and forth to my neighbor’s feeder then tucking themselves into the conifers to sit, split seeds and watch over the dogs carefully. It was the only sign of spring visible as I neared the crest of the road and the northern wind found me. My being without a hat, a nod to “spring”, frozen ears, a nod to winter. I’d spent some of my morning in conversation with a string-player friend who was struggling with tendinitis, a common injury among us. It is an ailment that can be brought on/aggravated by frequent use or, especially in early players, by working too hard. What is infrequent is the number of times you’ll hear an instructor tell you not to work too hard. However, at the very center of playing a stringed instrument is the question, “how much muscle is too much?” This issue comes up the first time you put a cello (let’s say) into your hands. Once you have been green lighted for using a bow vs pizzicato, there is the great temptation to play twenty three out of twenty four hours a day. You run to your instrument first thing in the morning, play for a while, get up, do some work, walk past the cello and suddenly you are seduced by all of that beautiful flame...so you sit down, play again for a bit...but, because you are new at holding the bow (not like your fork, your pen, your paintbrush, screwdriver, steering wheel….) your hand decides the only way to make this thing do what you want is to grab it but good, herein after known as the “club grip.” That grip, in itself, causes tension on your elbow because of the position it bends your wrist into. So, using that incorrect club grip twenty three out of twenty four hours per days adds up to that elbow seeing a lot of unwarranted action. You find that while writing a check, the simple act of using the pen causes you pain as if writing the check itself is not pain enough it seems. Your instructor continues to have you hover your right hand over the bow, take a deep, cleansing breath and, very zen-like, release the hand down onto the bow then slide it into the long-explained (herein after known as hated) position. Watching yourself in a mirror, every time you see your hand sneak back into the more comfortable, easy and incorrect position...you stop that sweet business and begin again. Now you are able to use your bow regularly with the correct grip. You work, feed your family and get dressed as well as play the cello. You begin to play pieces and find that once in a while you recognize them as such. However, in that same practice mirror, the Evil Queen looks back at you as you play and chastises “That right elbow IS always bent….you DO look like a pirate hoisting a mug!” “There is so much going on,” you retort, “sixteenth notes, dotted rhythms, staccato, legato- who can open their elbow while bowing at the same time as trying to read that micro-printed music?” So your brain focuses so hard on reading and your still pirate-y right arm reacts by mirroring that effort- pushing even harder to hoist that mug. The next day you find that trying to lift your dog into the bathtub, because of the freakishly early mud season in February, is not only painful in your elbow but now your shoulder is belly-aching as well. Time off the instrument takes heat off the joints...for a while. Your instructor notes that it is winter and the strings are actually almost touching the fingerboard...can it really take that much effort to put them down. The effort...the effort. It seems that in almost every other endeavor extra effort is rewarded. In bike racing it is what wins the Tour De France. In playing the cello, I like to call muscling the “anti-cello.” The still fascinating thing to me is what that requires of us. Recently music that I was working up for a performance had some super fast runs that were apparently written for a player with bionic fingers...but I persevered. I practiced them slowly, I broke the runs apart, I named the notes and intervals in my mind and I swore. At the end of my practice sessions I noticed my right elbow was cranky and it struck me; the exertion of my brain was directly proportionate to the exertion in my right arm/hand. When I sat down again I took a moment to focus my brain, to let the notes come to me slowly, no matter how fast I was playing and I took note that the bow had begun to drop into my hand vs my trying to manipulate it. Suddenly things were much easier to manage. Part of learning to play this instrument, perhaps all instruments, is learning to center ourselves. Performance, especially, requires us to be still within ourselves in the midst of chaos. Our brains have to delegate responsibility to our right and left hands and then leave them alone, trusting that they can do the job without too much interference. After all, isn't delegation at the very heart of all success? It was one of those perfect winter days in Vermont; the snow had been falling all night and was continuing into the morning, the flakes coming down so hard it looked like a scrim passing over the landscape. I looked out at the thermometer which read ten degrees. Our picnic table bore a bowler hat of white. When I say it was one of those perfect days it was, in part, because we didn’t have to drive to work in the storm. I sat at the counter in our kitchen with a cup of peppermint tea and watched it unfold. Warm next to the wood stove, our dogs splayed at my slippered feet, I let it be. When we kiss each other “goodbye” in the morning Paul's commute is about 30 yards to the cello shop while mine is a no-boot-required 20 feet to the studio. I have friends and family on both sides- those who work in an office-type setting and those who work from home. Not that long ago the only people who worked from home were moms and/or artists. Finally the workplace is beginning to catch up, realizing that there are many ways to get things done and many spaces that people can get work done from. The benefits of a happy worker are becoming more and more apparent to companies. Now people work from their computers at home. I know several people whose home office is a plane ride away. For a weekly online meeting the top half of them is in presentable office- fashion while their bottom half sits comfortably in baggy sweats and all is well. On the other hand they not only don't share lunch with their co-workers, they often don't even know what their co-workers look like. When you work solely for yourself you not only dictate the hours of your business but you also dictate the philosophy and the execution of it. When someone calls Paul Perley Cellos they always speak with one of the owners of the company - someone invested in its success which means someone invested in the satisfaction of that customer. Now, like with the weekly online meeting attire, the fact that we are in our kitchen means that you might be talking cellos with me while I'm washing dishes in my pajamas. Flip it again though and we see that while there are no retirement accounts, sick or vacation days, there is also nobody who will downsize our business unless it is one of us. If one of our kids was sick when they were in school, there were no daycare hassles and we made every basketball game. If it has been raining all week and the sun suddenly comes out - so do the bikes. In the summer we might be talking shop but our feet are in sand, our mouths full of crackers and cheese. The bottom line is that the people we have to trust are us. When you choose to work for yourselves there has to be confidence in your ability to take care of things because we are the bottom line. Fortunately that is our strong suit (and the only suit you will see us in): Paul and I have faith in us. We share the philosophy that a good business is built on the trust between the customer and the shop. I know it is a rare thing for a happily married couple to also be happily married business partners. So many of my friends choke on their salads at the idea of working with their partners. It does give a whole new meaning to Yin and Yang. It works for us because we really do enjoy being together- but we also recognize that we bring very different things to the table. Paul is a wonderful negotiator, he is fair, kind and is able to see all sides. I can run out of patience more easily (I can hear you kids…): if I'm not doing well in Backgammon, I tend to tip the board over. However, if someone has “forgotten” to pay us rent on an instrument or needs to be “reminded” that they owe us for a repair...I'm your gal!! Yin and Yang. In the end we realize that, as my sister so aptly puts it, “we only get one spin at the dance.” We get one chance at following our true passions and creating our own destiny. When someone says “I'd love to work for myself, but what about security?” We’ve seen too often that security is a myth. Every day we hear of companies laying off employees who have dedicated their entire adult working lives to that company. Years of retirement savings stolen from people just when they need them the most. My boss, while hard on me, is also fair and kind to me because my boss is me. You can keep your gold watch and dental plans. We will probably always have to work, but the bonuses - all of them - really belong to us. As I write this I am watching the snow pile up outside the studio door. The picnic table that houses a big bucket of geraniums in the summer wears a cap of white. Sam begs at the door to go outside only to turn around and, within minutes, push against the door to come right back in to lie on his side next to the woodstove. it was a good effort though. A peaceful moment in an otherwise chaotic season. As we finish packing away the holiday lights and vacuuming the needles there is more than piles of snow at the studio door, the music competitions stand just outside waiting for our attention. It is a challenging time of year for music students (and their teachers). For my studio there begins the preparation for the regional festivals, both middle and high school, as well as the All-State and New England music festivals which require auditions. Adding to it I have a winter recital. So it seems students are required to be All-Everythings. I have a unique vantage point from both sides of these competitive auditions. I have to prepare students for them as well as being an adjudicator for one of them, A bit of a two-hat situation. Preparation takes months. We begin working on audition scales in the fall so the work doesn’t all come crashing down just before the holidays. For some auditions you choose a piece from the list provided and for others you have to be prepared for a required piece or pieces. I let the students make their own decision about competing. I am of two minds (which works well with two hats) about it all. On one hand just being part of music competitions and festivals looks wonderful on college applications. Also I believe that preparation of anything helps all of us learn how to bring out the very best in ourselves and to strive for excellence (thus my recitals). There really is no better reason that requires us to narrow down our focus on the details of playing. That said, I understand the difficulty in both the preparation as well as the actuality of auditioning; I have watched the bow of many capable cellists almost bounce off the strings in response to their extreme anxiety about the process. For the New England auditions there are only twelve cellists chosen. It seems to me that perhaps the most important part of the preparation process belongs to the teachers and parents of the auditioners. How to we respond if our student/child is not one of the twelve chosen? In the hours spent driving to lessons, listening to scales, being human metronomes, carrying around bags of pre-lesson snacks, how much of ourselves become entwined in the success of the student? As teachers it is a great resume builder to have our cellists get into the events they audition for but how much time do we spend assuring our students that not only is it not imperative that they “make it” but they really don’t even have to audition if they would rather not. This is a hard world in which to be a child. What kids need to succeed is a sense of self esteem that will help them believe that they are capable and worthy not only as little-leaguers, soccer stars or concert musicians but simply as people. It is here where we, as parents and educators need to focus our time and attention. Maybe our musician is completely contented in concertizing for the stuffed animals in her bedroom. Success can have many definitions. We had just wheeled the wood-splitter down to the lower shop. Such smugness found in looking at the woodshed stuffed with two years worth of wood, one drying for the following year, one ready to roll. We could relax a little, take the dogs on long walks down the dirt road scuffing the dead leaves as we strolled. We could take our time in raking the leaves out of the front yard into giant piles destined to become a comforter for the raspberries sleeping in our garden. Saturday morning we woke up to white. That’s how it works in the Northeast, the change of seasons falls upon us, surprising us with it’s resoluteness. Yesterday we wore a sweater and spoke of pressing apples and carving pumpkins: today we bundle up, dragging winter gear out of storage. My Muck boots are pressed into service: they are bone-dry and bearing cobwebs for their first few steps into the snow. Yesterday we raked, today we shovel. Early November snowfall can be staggeringly beautiful. The trees look like they have been sprayed with white frosting. They arc gently over the road creating the Christmas card- perfect pathway to our house. However what we all know is how heavy their branches are with, not just snow, but ice. As I drive through the tunnel I hunch over the steering wheel and hold my breath, I know how fragile these branches now are and, more important, I know how close we are to that dreaded period of time without power. As I mash avocado for toast the lights flicker. Each flicker makes me stop and look around, as if I might see a red flag giving warning. Each time I go back to mashing it happens again. I find myself picking up my pace, quickly washing all of the dishes because, although we have a well, without power, there is no pump. Without the pump...there is no water. Lack of power is super romantic. For ten minutes or so. We have lots of oil lamps at the ready and their warm glow makes you think that you really might have been able to live out of a Conestoga wagon- I mean, how hard could it be? Five hours later Paul has to listen to me admit that I’m not a pioneer and begin my litany of swearing. Five years ago an early storm shut the power off for five DAYS. Day three Paul was at the store looking for a generator. Supply and demand dictated it’s exorbitant cost. Little did they know that I had told Paul not to come back without that generator. I believe the final amount I was willing to pay was just under one million. I truly considered that our son, with the ink still wet on his college diploma might go for a good price. Saturday morning we woke to white (but with power)- a Christmas...well...Thanksgiving miracle! However, as we gazed out the window at the beautiful drooping branches we noticed that among them were some not-so-beautiful drooping power lines. It seems a large tree had pinned the wires to our stuffed woodshed. Power-outage homes numbered in the 6000 range, so for five days (five seems to be a magical power number) we watched the orange flags we had draped over the wires blow merrily in the breeze. No gas delivery: the truck could not get under those flag-flapping wires, no Fed Ex delivering cellos and no town plow. So, as we live at the end of a dead end dirt road, it seemed we were quite on our own. The snow kept coming, so without a plow the cars that could come in began to pack the snow down into a skating rink. Futility was vividly demonstrated by taking cupfuls of sand and tossing them onto the road. Students somehow made it in and I gave one lesson by stand-light alone. Luckily my student Luke is ten, with ten year-old eyes, so he thought it was a wonderful adventure. Paul and I pulled Luke’s dad out of the end of the dirt road as he tried to turn around in a Honda Fit. We charged down the road with our shovels and trusty cups of dirt. We looked like a classically trained towing team. David’s Prius got stuck in the driveway and yes, I have asked him why the Prius and not his truck. Paul grabbed hold of the door-frame and I pushed from the front of the car, David peering over his steering wheel at me. Apparently you can’t gun a Prius - some mechanism convinces it to go to sleep when you try to get it to roar, heck, even move backward. So we mightily pushed and, without any help from the car, it began to move which also began to make my Muck boots slip- apparently we missed that spot in the driveway tossing sand: suddenly I fell forward and completely disappeared from David’s sight. David went into a panic, he had killed his cello teacher, when, in reality, I was on my knees on the ground, hysterically laughing. We love Vermont. We love where and how we live. The challenges we face are what make us feel alive. Falling down is a given- it’s always about the getting up. I’ve decided that maybe I am part Pioneer after all. There aren’t many days that I don’t enjoy teaching. I love puzzling over how a certain student learns best. Message given one way to Chris won’t have the same effect on David. Jen is an engineer by trade so learns analytically, Joyce is a painter, she learns with her heart. People studying the cello are, for the most part, a warm, interesting, curious group. Sometimes the week is long, Wednesdays are back-to-back for seven straight hours, making it a dilemma on where to shave off the few minutes it takes to run to the bathroom between students! And of course not every lesson day is perfect. There are days where a few too many people have been too busy to practice….again. It’s not good news when you ask someone to turn to the page that the assigned scale is on and they ask “what page is that?” Or better still - when someone (sorry to pick on the teenagers) tries to sight-read their etude. Dotzauer is many things to many people but sight-readable is rarely one of them. But these are small things. I love what I do and am grateful to be able to do it. Today one of my student,s who is closer to the beginning of her path, emailed me a video of herself playing familiar Christmas carols to an Aunt in a facility for memory care. I could hear O Come All Ye Faithful playing in the background while the camera was fixed on her Aunt’s face. I watched her look a bit confused at the beginning of the playing but then I could see recognition set in. Her hands, thin and fragile, lifted like small birds from her lap in an obvious attempt at gentle clapping along with the rhythm. She watched the cello with a new smile on her face as it was being played. It was pure magic. I was sad to see the clip stop her Aunt, suddenly frozen mid-clap. Included with the short video was a photograph of my student and her husband sitting on either side of her Aunt. What struck me was both the family resemblance of the two women but also the shared joy on their faces: both moved by the experience. Paul and I watched a documentary called Alive Inside not long ago. It dealt with a retired doctor who had specialized in brain function. He brought tiny audio systems to elder-care facilities along with head-phones. For each patient he asked a family member to tell him what period of time in the life of the patient would be most remembered, most significant to that person. He then programmed music of that time, ie if someone was a teenager in the fifties he programmed fifties rock songs by a favorite artist. The camera was fixed on their faces without moving. Some patients’ heads were down in a state that looked like sleep. The doctor put the headphones on the patients and within a very few minutes of the music connecting to their brain they began to come to life, often in miraculous ways - singing along with the music, laughing, telling stories. If the camera had moved one might think it was all an illusion, but we watched it happen in front of us. Pure magic. After some time he would take off the head-phones and within ten minutes that person would return to the state from which they had climbed out of. It happened over and over again- Alzheimer, dementia, age - it didn’t matter. He explained to us that music is inherent in all of us: we understand it without knowing that we do. How many times have we watched a young child, under two, bouncing, in perfect rhythm to a song being played? I had explained that film to my student and she took it one step further by bringing her beloved cello in to her Aunt. It didn’t matter what she played, it didn’t matter how she played, only that she played. Interestingly, the benefit to her Aunt was clear: but just as clear was the benefit to the player. When she was playing without regard for perfection, without tension about reactions, there was true joy in her music. I could hear it. It was about giving, not receiving. As I sat at my computer and watched real life evidence of what the doctor had spoken about in the film, I watched a gift being given. The gift was from student to Aunt, and Aunt to student. And, as surely, the gift was to me as well. Sitting there I had the unique opportunity to see, quite literally, my work at play. I am humbled and remain grateful for that chance. For weeks color has been creeping up the trees but this weekend we are fully aflame. We’ve been able to spend time wandering down the dirt road watching the leaves spin lackadaisically to the ground. The smell of wood smoke curling out of chimneys is new again. Paul and I bought a cider press. Each morning we use apple cider in our fruit smoothies so we decided that, along with the forty quarts of raspberries from our garden that we froze, we would press the apples on our property into service. We found that approximately a half-bushel of apples yields a gallon of cider. Juicier apples = more juice. We gathered all the apples on our land and when we ran out of those we carried milk crates, at all times, in the back of all cars in order to be ready at a moments notice to gather apples from the side of the road. It must have been a comical sight to see us leap from our vehicle, crates in hand, frantically picking apples only to run back to the car in to do it all over again a few miles down the back roads. Along with the cider press we bought an apple chopper so technically there are three jobs in this endeavor; the chopper-cranker, the chopper-feeder, and the presser. Luckily our son, Josh, is around and is young and strong so we quickly gave him the job of chopper-cranker. The chopper-cranker has to turn the crank constantly while it is being fed the apples. I gave myself the job of apple feeder because its much easier to look at the leaves spinning to the ground if all you have to do is toss apples into the chopper. I did find that if you are watching the leaves falling you are likely to throw apples over the chopper instead of into the chopper which tends to irritate your chopper-cranker. I could see the frustration in his eyes even behind the handy-dandy, super-necessary plastic goggles he wore to deflect chunks of chops. Paul pressed until it became almost impossible to press anything else out and then we had Josh step in and use those twenty-five year old muscles. What was wonderful about making cider is that, even knowing how things work (apples are pressed and juice comes out) there is true magic in putting the pulp into the presser and almost immediately watching the cider flowing out of the holes. No matter how many times we did this (and it was a lot) each time we “ooohed” as cider poured into the steel container. We stuck a community glass under the spout of each batch to taste the first pours. There is something wonderful about sitting outside on a beautiful fall day sharing a glass of apple cider that you have made yourself. We froze fourteen gallons of cider for the winter. It gives us great pleasure to take what we have, modify it, and make it work for us. Susan finished playing a piece that was particularly challenging for her and turned to me with a tepid smile. She wasn’t sad but wasn’t happy- she had practiced and clearly was working hard but what was missing in her smile and playing, was joy. We talked technical for a few minutes then I told her what I had seen in her face. I told her that I had read somewhere that Beyonce, the singer, created an alter-ego to help overcome stage fright and simply to become more fierce: the actual word she used. It is obvious that we need to practice, need to put in the time working the music- but of equal importance is finding/creating a joie de vivre, that certain something that resonates through us and into our playing. When someone is able to tap into that, music becomes much more than playing notes. The following week I was finishing up with my 12:00 lesson and I heard the familiar clunk of a cello case trying to navigate the narrow path past my washing machine into the music room. Expecting Susan, imagine my surprise when “Suzette” breezed into the room. On the outside Suzette looked suspiciously like Susan but oddly greeted me in french. She wore Susan shoes but a scarf was casually tossed over her shoulders, a beret rode jauntily in on her head, and Suzette’s smile was framed in fire-engine-red lipstick. Susan is retired from finances, Suzette doesn’t feel the need to work at all. Susan is careful and calculated, Suzette is flippant and fun. Susan uses only the first third of her bow, Suzette often uses such big bows that they end up on the floor...and she does not care. Suzette carries several bows for that very purpose. Suzette has accompanied Susan to several of her lessons. We have found that we allow Susan to be in charge when it comes to things like counting and rhythm, but we let Suzette take the reins when it is time to play with abandon. If I find Sue (a combination of the two) drifting into being particularly careful, her focus causing her bow to dramatically shorten, I ask her to reach up and rub her beret, a touchstone of sorts, to remind her who needs to be in charge of this particular task. We are finding that it gives her great pleasure to take what she has, modify it, and make it work for her. Suzette decided that she would like to come into our cello shop and try instruments. She felt that an older cello, with all of it’s character and complexity would suit her better than the cello she had been playing. Beret firmly in place she sat in the shop for several days playing cello after cello. Finally she turned to us with a big red-lipsticked smile and declared: je suis fini! Interestingly though, when it came time to write the check- it was signed by Susan. It’s important to me that the studio be flexible. I like people to feel that they are playing in safe space; free to groan, grumble and gripe if need be. However, there is one word that is banned from use for everyone - including myself, perfect. When we make the decision to put ourselves out there- to take a chance- it is nothing short of walking a tight rope of emotion. One slip, one mistake and off we go into the deep waters of insecurity. I often open a student recital by talking with the crowd of expectant parents, spouses, friends and neighbors and reminding them how brave this endeavor is; not just the performance but the trying. I have a friend, Daniel Patrylak, who was the original first trumpet of the Eastman Brass Quintet, a superb musician and wonderful man. He once told Paul and I that he had never heard a perfect string performance. He wasn’t being critical of string players, he was simply conversing with us about the reality of things. Instead of feeling discouraged by this, we felt it was actually a gift. How empowering if we can play without the concern of perfection. It’s not going to happen so how about we just let that idea go and be all that we are capable of being? Nothing is beyond criticism. No matter how much time we put into making something “perfect” there is someone who can find fault with it, so that very effort wastes our valuable time. I say Horowitz every single time. In my studio I spend an inordinate amount of time turned to face my students so that I can not only hear but watch them play. I’m looking for correct body posture, hand position, relaxed muscles and the all-important breathing. It seems counter to logic but it is amazing how many people forget to breathe when playing. I find I need to give a little elbow nudge once in a while, often eliciting a quick, full breath not unlike a snorting snore sound. Mainly I’m looking to be sure that players are at ease, that their bodies are as comfortable as they can be in the middle of an intellectual and athletic task. That can all fall under the umbrella of “correctness.” I’m looking to see that they are playing “correctly”. One of my teenage students whom I have been working with since he was in grade school and is now in early high school came to a lesson the other day. He took out his cello, set everything up, tuned and proceeded to put the cello slightly out of his lap. I sat down, arranged his notebook, took a drink of water and gestured for him to pull the cello up higher into the “correct” position. Each time, each week this happened and all was well in our world. It seemed simple enough to explain; if the cello is sitting too low in your lap, your hands are not going to reach the upper positions easily, and the soundpoint of your bow will want to fall too close to the fingerboard. Traditionally, depending on the cellist, the C peg should sit somewhere on an arc that begins at the back of the base of your neck and ends somewhere behind your left ear. I even finished that explanation with a tiny flourish- it was that simple! Again….”Why?”- only this time he showed me that, although the cello sat lower on his body, the peg fell on this arc and he felt he could reach the upper positions quite easily. And this was comfortable for him anatomically. I defaulted back to hand signals, he brought it up slightly and we finished the lesson. However, the lesson stuck with me and presented a dilemma: what if “correct” could be subjective based on a person’s anatomy, or even personal preference? In the “correct” methodology is there still room for uniqueness? No one argues with the brilliance of Yo-Yo Ma but not everyone agrees with his hand positions. It made me think about how change can come about if we don’t ever allow things to change, or at least bend. I would like to be the person who listens to what people have to say. To not feel that I have every answer to every question and to be respectful of our differences as well as our similarities. Perhaps a young cellist can show us a new path. And for now, his cello is not too high, not too low- but just right - for him. There is a challenge for every cellist as she begins to traverse the path from early to mid level player. Most students begin their study with their hands in first position- aka- “the block”- The block helps with the understanding of hand position for whole and half steps. Because I like to minimize stress on the hands, it is my goal to move students out of the block as soon as their understanding is solid. Herein lies the challenge; it seems I put you into the block simply to move you out of the block! Movement away from the block involves the introduction of vibrato. I like to talk about the physical aspects of vibration but also discuss the necessity of patience with the whole process. Vibrato is like a free-wheeling party guest - you can invite her but you can't predict when she will arrive. Working on vibrato can produce tension which, interestingly, is the anti-vibrato. Too much stress and the hand is not free to move and you will tend to create more of a tremor than vibrato. If you are working on this or any new technique and begin to feel aggravation, it is always best to put the cello down and take a break. When the desire to throw your bow abates - you are ready to return to work. As you become more advanced in vibration technique, the notes that you are not vibrating will become more noticeable. When working in the block your hand stayed in that position, the balance point being the center of your hand. Now that you are vibrating finger to finger you want to have your balance point be over the finger being vibrated. Most of the center fingers are easily balanced, however, the first and fourth fingers are notoriously imbalanced. Moving away from the block naturally creates anxiety about moving your hand “free form”- understandably we feel safer with our hand in the block, the position that we first begin in. It is now that I begin to introduce the idea that your hand is always in motion. It may not be visible but flexibility in our left and right hand becomes more and more important as we begin to work with more difficult music. Vibrato itself introduces more relaxation into the hand. If you work slowly through vibrating each finger you find that if you are able to focus on the offending imbalanced first and fourth fingers you are able to “over balance” the fingers by exaggerating their position for a while. For example, when you are truly balanced on the fourth finger the balance point will be on the fourth knuckle and, rather than keeping the finger leaning toward the others - exaggerate its lean away from the other fingers in the vibrating arc. It won't be necessary forever but will help to keep us aware of the need for flex in our hand. When practicing it remains important to really listen to your playing. The ease of recording on phones makes hearing your intonation and vibration much more possible. It can be a painful part of practice but it is invaluable. Is your vibration moving in a wave motion from note to note or are there notes that stick out because they aren't being vibrated? If so, you can bet that there is imbalance in your hand. It is scary to release your hand, to gather your fingers into vibration and moving rather than reaching. But there is no freedom like a released hand. One that has the flexibility to “go to” the notes. The balance in our hand allows us to be more exacting in landing our notes and, once there, to make small adjustments instantly as needed. In our hands, as in our lives - balance is key. Paul and I stepped off the elevator and wandered down the hall looking for the correct apartment. We’d landed in NYC just hours earlier. I knocked softly and Jacob opened the door. After we’d spoken for a while he left the room and returned with his cello, the reason we had come. I noticed he kept a tight grip on the instrument as he talked with us about the technical part of its history. I mentioned that it must be difficult to sell the cello that he’d had since he was a child. “Not really,” pause, “I hate this cello.” Silence. Our quiet seemed to open up the box where the truth was living. His eyes filled as he told us about the hours his father had forced him to practice. Relentless years of criticism, frustration and rage. He had not had the courage to get rid of the instrument until after his father’s death. However, as we reached for the cello to begin packing it up, it seemed difficult for him to release it. His beautiful instrument sat quietly, keeping his secrets, loyal to the end. There was true relief in us walking out with it, but there was also true sadness. The cello landed at Barbara’s home on Friday. She opened her door and squealed at the sight of the massive box. She had been waiting for this day, for this instrument. When we contact the woman who placed this cello on consignment with us she is thrilled that it has found a new home. Her emails can barely contain her relief that her old friend is safe and being played once again. Paul and I are the matchmakers. We bring home the cellos of your mothers, grandfathers and the failed experiments of your children. Stories filled with symphonies, immigrant crossings and stardom, of accidents, suicides and failure. For the college student who has taken a loan to buy the cello. For the adult who played as a child but gave it up. Until today. For the beaming teenager with the slightly nervous, but smiling, parents. It is what we do and we are honored by the task. Recently we needed to be in New York to have a cello bow evaluated for a sale. Our first thought was to hop on a plane. Immediate thought number two was expense. Another option, which we have taken many times, was to drive. We love a good road trip, hours to catch up with each other, the freedom of unlimited bathroom stops, the great road snacks. Then our final option, the train. This option, while not without cost, seemed a no-brainer to Paul who has loved trains since he was a little boy. So we made the drive to the Rutland station to catch an express train to the city. We clamor on board whacking our suitcases on every other seat as we maneuver down the isle. I should note that travel, on the whole, seems to put me into another time dimension altogether. The minute we get into an airport my heart begins to race and I feel the need to run…. everywhere. I race to get coffee, zoom into the bathroom and breathlessly grab a magazine for the trip. I sprint back to our gate only to find Paul dozing in the waiting area since we have another 2 hours before we fly. Our scheduled train departure is 8:00 AM and, sure enough, exactly at 8:00 I feel a lurch and we begin to move. In travel mode, I quickly gather my possessions around me. Three books which require reading glasses, so regular glasses get safely, but speedily, stuffed into their case. I check my credit cards several times to be sure there is good access in case I feel the sudden (obviously) urge to nosh. We begin rolling and I find myself leaning against the glass watching the world chug past. Train tracks are actually behind everything. The path that we are taking seems to put the utilitarian side of things toward us: people have taken time to renovate the front of buildings but tend to leave the backs untouched. Looking at the rickety back stairways leading to old porches, it seems as if the laundry swinging on the lines is waving to us as we travel by. Crooked sheds, stuffed behind modern facades give us a glimpse into other decades. I can almost see my lanky, high school age father making lay-ups in the net-less hoops leaning off the wooden garages.We see the back doors of large businesses. The places where they keep the industrial size garbage bins, and the picnic tables where the staff sits, smokes and watches us watch them. The morning sun warms the glass where my forehead rests. If I close my eyes into the warmth, even for a second, I am sound asleep. The rocking of the train is primal and my body remembers it. This train travels along the Hudson River and soon I’m gazing at ice chunks swirling around small patches of open water. I see lighthouse after lighthouse perched on piled stones. Small but sturdy in their offering of protection. Because we are on the Hudson and not too far outside the city we are voyeurs to the backs of huge abandoned houses. Paint peeling from the gingerbread decorating the roof line. Enough left of them to help us imagine their ornate stories, enough left of their stairs to the river that we understand the privilege. Barges calmly stomp their way through the ice, unflappable in their steely determination. I can see a deck hand scurrying to a task - strange to see him in a wool hat and gloves on a ship. Someone comes around to collect tickets. They make friendly banter with us about the cold then tip their train hat as they pass by. Time changed only by the scanner for your tickets instead of the punch- much to Paul’s dismay. My books sit next to me untouched. Paul mentions heading to the food car for some lunch and I lazily offer up my order but never break my gaze out the window. Quickly nearing New York I find that the slow and steady rhythm has been deceptive. We pack away our unused books as we come into Penn Station. We remain relaxed in our seats entering the darkness of the tunnel. And here we are in New York. I recognize that I would have made it to this place had I chosen to travel in any of the other means available. What has mattered on this trip is that I’ve realized that the journey, not unlike the journey of learning the cello, has been as important as the destination. It's Ella's time to shine. She has been studying with me since she was in fourth grade and is now a high school junior. She sits in her weekly lesson ready, if not willing, to discuss her piece for the winter recital. Normally my theory on choosing repertoire is to choose music that reflects new found ability of the student as well as some of their personality. This has worked pretty well although I have found that Ella has cajoled me into letting her play a duet a few more times than I'd like. There are two reasons this happened, one: having four sons, I do understand that high school students often have too much on their plates. Two: I am a sucker. This season as we sit down for the discussion I silently hand her the Brahms E minor Sonata. She takes it, looks at it, looks at me and sets it on the stand. I literally watch the wheels turning behind her eyes. “Are you kidding?” “No.” I answer. Early in high school Ella would do all of the things I asked of her but not much more. Her parents had helped her purchase a beautiful older cello and there was a definite sense of obligation in her study. But as she rounded out of her sophomore year things began to change. She auditioned and was accepted at the Apple Hill music camp: she found that she knew more than she thought and, better still, it mattered to her that she did. Suddenly playing the cello made her even more special. Handing her the Brahms was handing her a challenge. That day she looked at me, understood, and accepted that challenge. Getting the notes came fairly soon, I knew that would not be where the difficulty would lie. Once we had the bones of the piece in place the work began. We had many discussions about the back story of the music. history has it that Brahms was living in Robert and Clara Schumann’s home, and shortly afterward helped Clara with her many children when Robert was confined to a mental health facility. During that time, possibly before, he fell desperately in love with her. The E minor reflects that desperation. It is a beautiful cry of pain. What I had to do was try to help Ella to connect to the music, to the story, to Brahms. I was asking her to internalize the notes on the page and bring forth her interpretation of what Brahms was saying to her. Letting the cello tell the tale. Adult students often struggle with the desire to make everything perfect, hitting every note being the ultimate goal. In doing that they often forget to tap into their experiences in order to really make the music speak. And kids simply don't have a lot of experience to tap into. Something I often write in notebooks about playing a piece is “Tell me the story”- This became my mantra to Ella. At first things like the recapitulation seemed simply like repetition to her. She would, dutifully, bring the main theme back with the exact same expression she had used before the painful watershed in the middle of the movement. What really changed things for her was adding the piano. Before going with an accompanist I sent her the piano part to play with from her computer. I asked her to put recordings of the piece into the background of her daily life, to listen but not really listen. At her lesson some weeks before the recital I had Lynette, our accompanist, come to the studio to rehearse the piece with her. As they began to play together, began to feel the way one was moving around the other, Ella started to really hear what Brahms had been whispering into her ear. Paul calls this moment “warming to the piece” it is the point when you can, literally, watch someone relax into feeling. To let go of the “have-to's” and just play. At the recital Ella rehearsed with Lynette and made a few comments to me about being glad to be done with the piece. Somehow it was a relief to know she had not completely let go of being a teenager. As her page turner I sat beside her as she began that most haunting of melodies. At the beginning she was totally performing, doing what she had learned to do from me and then she began to warm to the music and it was transforming to her, for me. Ella was pleased with her performance, she could even give me that, but what she couldn't say, but what I know for sure, was that she had taken up the challenge I had thrown down and succeeded not only in getting the notes, but telling us the story. Sitting on the stage during the sound check I shield my eyes and look out into the lights to see where Paul and Josh are sitting. I laugh with Tom, the clarinetist, questioning the likelihood of good intonation from a silver flute resting on the cold floor under his chair. I’m not really concerned about the fact that I’m tethered to my amp by the tiny microphone stuffed between my strings. My concern really lies in the relationship of the feet of my bench to the edge of the small stage. There seems to be a real possibility that I could be moving with the music and simply disappear off the side of the platform. This thought takes up so much of my attention that, in deciding to make that one last trip to the bathroom, I stand, cello in hand, and begin to step down from the stage, turning first directly toward my amp. The feedback is fast and furious. Think high pitched car alarm. Fortunately the rest goes much better. We start the set and the amplification of the cello is perfect. The audience is able to hear the cello lines and, better still, so am I. It is the first time I have been miked for performance. I was quite uncertain of how I’d feel about it all but even in testing the amp in the store I realized the positive benefit was how really hearing yourself helps with everything from pitch to vibration. Small details are much easier to pick up (pardon the pun): I find myself wondering how the Arensky piano trio would sound amplified…. It was/is new territory for me as a strictly classically trained cellist. I think I was so nervous about anything improvisational that I wasn’t able to fully see/hear the possibilities for true learning and growth. Playing that night, it was clear to me that what I had been learning was much more about listening than about improvising or adapting to a new style of music. As we wove the melodies around each other I felt that being out of what I perceived as my element made me more conscious of how my part fit with the other musicians’ and I was able to enjoy “playing” in a completely new way. Reminding me that real growth is only possible through struggle, and with the risk of failure and falling off the stage present. Sitting down to practice I look at my music and can hear the notes in my head, I bring the bow to the strings and begin- only to find that, while the notes in my head are correct, the rhythm is squiffy. septuplets and sixteenths and duplets and triplets...these are a few of my favorite things….I need the Doctor. Dr. Beat that is, my metronome. When you are beginning to study an instrument the introduction of the metronome is both a benchmark and a catastrophe. It’s seemingly simple to clap along to quarter notes that aren’t moving too quickly- we do it at concerts with our hands AND feet. Yet being metronomic, by definition, is being exact. As we try to clap precisely with a downbeat we often find ourselves lagging...or speeding. 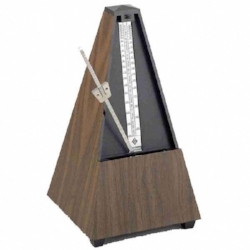 I very clearly remember being at lessons as a child, watching the triangular wooden metronome sitting atop the piano. Hearing that distinct click with the added necessity of winding every so often. My teacher also had a ticking clock that often fell on the off beats of my metronome pulse making things even more confusing. Trying to clap to two separate rhythm sources while watching the clock for the lesson to be over was nearly impossible. In making introductions between metronome and students I remind them that we are all hard wired for music; we live surrounded by pitches and day-to-day rhythms. The most consistent pulse of all being our own heartbeat. As important as logical thinking is, I ask that this is one area that you ‘feel’ rather than work through. I find that the consistent sound can be rather meditative. I took a Eurythmic class and the instructor and I spent a lot of time sitting, eyes closed letting the steady pulses wash over us. After a time we would begin softly clapping- the task seemed so much easier after quietly “feeling” the beat. Once someone is ready to begin metronome work I will assign a piece that is very simple, rhythm and note wise so that all that is required of the brain is to feel the pulse. I ask that each session begin with clapping of the rhythm, no bow or cello in hand. In dissecting music you are getting ready to play- notes and rhythm are of equal importance. Even if you have no idea what the piece in front of you sounds like- if you can clap it- you can play it. For a while, once out of the studio, this clapping stuff is confusing. You are trying to clap eighth notes but they seem to be coming sooner than needed...and forget those sixteenths. Perhaps it would be easiest to practice without that thing for one more week? The metronome is why I have tissues in the studio. But once understanding kicks in...oh how things change. Suddenly everything is untangled by the metronome- he is consistent and never lies to you- he really is your friend! So now perhaps it would be easiest to practice with the metronome on for everything? I’ve often thought how wonderful it would be to have a “life metronome” - a little black box that could hang around your neck- it’s sole function to explain and untangle everything. Bet they’d sell it on Amazon. This past April Paul and I were sitting on an old trolley winding our way up a hill in Lisbon, Portugal. As I sat in the cracked leather seat, basking in the sun, a light breeze coming through the open window, I realized that I wasn’t able to understand one word that was being spoken around me. This past August I walked into rehearsals for two bands that I am a new member of. They both rely on an eclectic grouping of people: many of the musicians play without written music. In discussions I realized that, once again, I wasn’t able to understand much of the language spoken. Previous to my joining the groups we were all open about this language barrier. We discussed the fact that I wasn’t an accomplished improviser: from the age of six I had only studied music written on a page. This was ok with them because they could not read printed musical notes- all of us clinging to the things we knew. As we began to explore our new relationships I found myself watching them use their ears more effectively than I have been- keying into subtle signals to know where they are in a phrase. Relying on the fact that everyone has been told how many times they would repeat something...why use a Del Segno? All of the music, even traditional pieces, are composed or arranged by someone in the group. When I became part of the gypsy/flamenco group I walked into the rehearsal cello on my shoulder, stand in hand and my translator/composer right behind me. It was an agreement that Paul would help bridge the gap between us. Fortunately Paul has also been an accomplished guitarist. In discussions, the guitarists would say that we would be returning to the A major section. I would have it marked as measure 45. It worked. Pushing myself out of my box is important; being in places where I don’t know where I’m headed, having to ask directions with my special kind of mime work, getting lost but then figuring it out, even deciphering coded musical emails. Whether in another country or in a new genre, it’s good for me to remember that there are many ways to speak the same language. Emmett’s mom and I are good friends. At the end of our lunch together she mentions that he hasn’t been doing much practicing this summer- fair warning for his upcoming lesson. The lessons themselves become a good opportunity to pass (some of) the mantle of control over. Normally lessons have a pattern to them and, even with input, I choose the repertoire. In the summer months I ask students to bring in music that they would like to play- caveat being it has to be within the range of their ability. That said, it gives me the chance to focus on their individual needs and wants.Ellen loves lyrical, familiar music, Chris craves straight-up classical, David wants to wrestle with Beethoven and Dotzauer and Jeff lightens up with some fiddling. Emmett’s mom was right (mothers always are), not a whole lot of practicing going on. Emmett fights the good fight- wrong notes are “just a goof.” I smile and nod; it’s summer. There is swimming to do, gardens to help with and bikes to ride. My job is to keep Emmett motivated until he is self-motivated. So, like sneaking broccoli onto the top of your kid’s pizza, I try to find way to keep him learning without too much pain. Emmett loves film music- especially the fantasy genre. Paul had arranged “How to Train your Dragon” from the film with the same title- as a cello duet for a wedding we had been asked to play it in. I casually took it out at Emmett’s last lesson- wedged it between scales and etudes. He was thrilled. His face lit up, he grabbed his bow and asked if we could play it through together. So excited that he never noticed it was written mainly in tenor clef or that there were four sharps in the key signature….. Apparently there really is more than one way to train your dragon. Paul and I aren’t organized packers. We are rather haphazard in our approach to what pieces of our lives will go with us on vacation. As a matter of principle; we only travel with carry-on sized bags. A bike trip to France is responsible for this habit; we dragged our own bikes, packed in enormous cardboard crates through several airports on our way to Paris. Paul is an avid cyclist and I love Paul, enough said. All of our possessions had been stuffed into four panniers that ride side-saddle on the bikes, they were then slid into the belly of the airplane. Three of those four panniers rode the carousel out of the plane in France...fortunately for me though, the shopping is not half-bad in Paris. The day (okay hours) before our summer vacation, we are, literally, tossing things into the car. Two dog crates nest together nicely creating a beach bucket, of sorts, for a plethora of “stuff.” Unfortunately, the size of the dog crates leaves no room for the very dogs who use them. A lake vacation, for us, is defined by the amount of time we can fill by doing nothing. No emails, no TV, no telephones and no practice, unless….two very close friends - one being the violinist in my piano trio - are getting married on the last day of our vacation and ask us to play for their wedding. And so...car two becomes filled with two cellos in cases, music stands, benches and, of course, music. Once the cellos take their rightful places in the car there remains very little space for anything else. So, what if our son, who is enjoying this vacation with (on) us has his car sitting in the driveway? Perfect spot for a week’s worth of groceries, loaded on the way out of town and, what a great opportunity for him to bond with two border collies! We finally arrive at the lake house in our merry convoy only to spend as much time unpacking as we did packing. Out come the stands, benches, music and those nagging instruments. A little work on vacation in the name of love. But, my bench is definitely facing the lake...even if it is through the window. Recital prep is all-consuming for months ahead of the scheduled event. In each recital there are players who work with a pianist and those who play duets or simply unaccompanied cello. For this spring recital it happened that there were a lot of students wanting to work with a piano. Some are experienced at it, for others it is their maiden flight. Finding someone to play with students is not easy: often I have wished there were a Match.com for students and pianists. Learning to play with other instruments, especially a piano, is challenging on it’s easiest days, and bear-like on others and makes me feel protective. Last season the piano at the venue where we rehearsed was horribly low in pitch. It required the cellists to tune down way below comfort level in order to meet the piano. One of my advanced students fiddled with the tuner to find what Hz the piano was at, wrestled with her wire stand (ultimately bending it into submission), adjusted and readjusted her stool then sat to begin. The lower sound of her instrument, coupled by the fact that we were in a church basement threw her. She glanced at the pianist, who smiled over the music, then looked up at me, who smiled from the corner, and began to play. Unfortunately as I watched her, immediately the tears began to run down her cheeks. I clamored out of my metal chair, Lynette knocked over her piano bench, each hurrying to comfort the distressed, yet still playing, teen cellist. Everyone had two rehearsals in the studio with Lynette on our piano. She drove here six times in the two weeks proceeding the recital, each day arriving with an armful of music, sticky notes in an array of neon colors fanning out from the pages of the books. Each day I would put a different, small gift on the piano bench. The second day she looked at me, questioningly, about “another gift?” Although I had definitely crossed into the over-gifting category, it was the only way I could think of to express my gratitude. We launched, we stopped, we clapped, we stomped, we added the third player- Mr. Metronome. Each time, every time, Lynette calmly smiled. Audrey sat down and beautifully played through the Chopin Sonata Largo movement the very first time she tried. We all laughed and cheered. Lynette stood and clapped. At the recital Paul and I dragged the small grand across the floor to be sure that the configuration that the students had been sitting in with the piano remained the same. Lynnette entered, arms full of books, neon stickies gaily waving back and forth. David sat down to play. He had, as had his trembling, told me that he was nervous. But, as we’d rehearsed, he focused on the gift of the music, filled his lungs with air, blew it all out and began. He used the big, whole bow that we talked about to get rid of excess nervous energy; he used a calm, low carriage and Mozart jumped out of his F holes. But, almost finished, his eyes shifted him to a line in the music completely unrelated to the one he had been playing and he momentarily stumbled, playing the incorrect line. Lynette glanced up from the piano, calmly smiled, threw that big net out underneath him and quietly, quickly and neatly caught him. It was in that moment that I knew the very real difference between a pianist, and a pianist who is also an accompanist. The snow has made it's final retreat. Tulips, daffodils and crocuses, as promised when I tuck them in during the fall, circle the bird feeder. Vermonters quickly lose their jackets and tip heads back in homage to the new warmth of the sun. Skis are put away. Gardens turned over, the clods of dirt still cold under our fingers. In our anxiousness to put something under earth we race down to the plot with our hands full of tools, gloves and persistent peas. Spring also means recital season has opened. Students have reluctantly, but carefully, chosen the pieces that they will work up to performance level. Making these choices and working up the pieces seems to turn over the insecurity that lurks inside us all. Sometimes during a lesson, but often afterward, conversation turns to the challenge faced when we are revealing something about us that is new, something that even we may not have realized before. Many times these conversations are peppered with negative comments about the effort involved in studying; not being enough, having difficulty making “real music”, being too young, too old, too male. At some point in our lives we seem to have been assigned our “roles.” That role might be about the expectations and goals of our parents, it might be based on the job that we have been working at our entire lives or it might simply be who we see in the mirror every morning. That assignment becomes how we define ourselves. Why not change those definitions? Who says that we are only allowed to be one dimensional; have one job, one goal, one partner, one talent? You can love theater and then study economics. You can work as a lawyer for twenty years and then become a painter. Be a mother AND a cellist. In doing the herculean work of rolling ourselves over to reveal previously undiscovered parts of us, we just might find that there is something shiny about our underbelly. What is important is that we are brave enough to take the chance on being all that we can be. To be defiant in the face of being kept in a role that makes others comfortable but us miserable. To know what it is that we want and to march, not walk, toward it. This begins even before the first lesson; it begins with the first thought of taking one.